Hurricane Sandy and Winter Storm Nemo are behind us, and the plows that moved tons of snow have been retired for the season. Hurricane Sandy and Winter Storm Nemo are behind us, and the plows that moved tons of snow have been retired for the season. But they have left Long Island residents with a new problem—a dramatic rise in the number and severity of potholes on our roadways. Temperature extremes and the beating our roads took as plows barreled through record-breaking snowfalls have left cracked pavement and gaping potholes that pose a serious threat to drivers. In addition, utility crews working on gas and water lines have left roadways in some areas seriously compromised. Not only can they severely damage a car’s suspension or blow out tires, potholes pose life-threatening situations for drivers who try to avoid them by swerving into oncoming traffic. Potholes form from moisture beneath the surface of the pavement. When that moisture freezes and contracts from temperature fluctuations, it applies stress to the blacktop. The weight of vehicles driving over these areas causes the blacktop to crack and chip. The more blacktop that chips away, the more the pothole expands in size. In addition, drivers and residents report that road conditions on Christian Avenue in Stony Brook following water main and gas line installations have been disastrous; and the town highway superintendent said that the permanent paving project will not begin for another two months. “It’s like a third-world country,” commented one resident. “It’s like driving down a bombed-out road,” added another resident fed up with the situation. Thankfully, some town officials have begun to take action. The Town of Babylon began its annual pothole blitz last month, sending out crews throughout the town to attack the problem. The Town of Islip purchased an asphalt crusher to recycle cracked pavement and use it to fill potholes. And earlier this month, Town of Smithtown officials voted to move forward with more than $8 million in road improvements, including the reconstruction of streets, paving, drainage improvements and curb/sidewalk repairs. If you encounter dangerous potholes on State-owned highways in Nassau County or Suffolk County, you can report them by calling (800)POTHOLE (800-768-4653) to notify the New York State Department of Transportation (NYSDOT). Potholes on other roadways fall under federal, county, town, village or private jurisdiction, depending on the area they are in. Include your stories or comments below or on our Long Island Living Discussion Forum. Do you have a pothole picture you'd like to share? Email us at news@longisland.com, and we'll be sure to include it in this story! 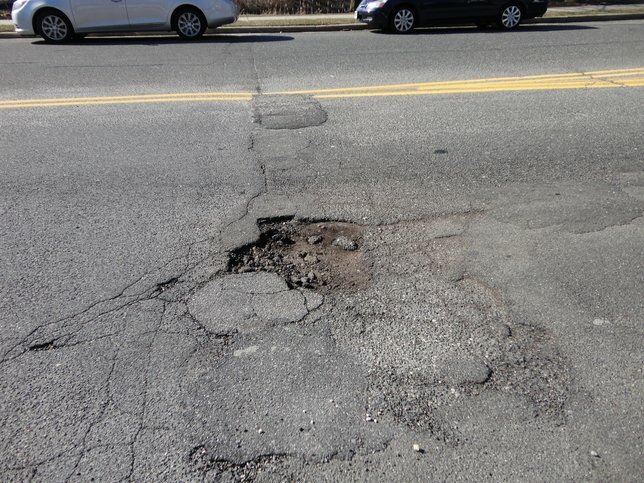 Subject: LongIsland.com - Your Name sent you Article details of "Pothole Season is in Full Bloom on Long Island Roadways"